Cruising Guides and Nautical Books | Have More Fun. Get Boativated! Over the years we have purchased and used numerous “cruising guides” for Pacific NW waters. The following is a list of those we think are the best. DISCLAIMER. Cruising guides are like anchors. There are lots of different ones to choose from and everybody has their own favorites. Some guides are detailed and specific and others are more like coffee table books with lots of pretty pictures. We prefer the former. The following list does not include all the published books. This is just a list of our favorites. There are many others but we are only recommending the books we know about first hand. To purchase one of these books click on the photo or click on the book title. Curt Epperson’s book “Keeping Your Boat Legal” is published by Fine Edge publishing. Some of the books reviewed below are also published by Fine Edge. Dreamspeaker Cruising Guides: These are perhaps the best “all round” Pacific N.W. cruising guides you can get. Authors Anne and Laurence Yeadon-Jones have spent many years researching, compiling, writing and editing to create these beautiful books. They are very high quality with many color photos, illustrated color charts and excellent detailed information and advice. These are great books for planning your trip before you leave and taking along for easy reference while you cruise. Published in the U.S. by Fine Edge.com LLC. A Dreamspeaker Cruising Guide: Vol. 1 -The Gulf Islands & Vancouver Island, Victoria & Sooke to Nanaimo, Revised 3rd Ed. Dreamspeaker Cruising Guide: Vol.2 – Desolation Sound & the Discovery Islands, 3rd Ed. A Dreamspeaker Cruising Guide: Vol. 3 -Vancouver, Howe Sound & the Sunshine Coast Revised: Including Princess Louisa Inlet & Jedediah Island. A Dreamspeaker Cruising Guide: Vol. 4 – The San Juan Islands, 1st Ed. A Dreamspeaker Cruising Guide: Vol. 5 – The Broughtons, Vancouver Island, Kelsey Bay to Port Hardy. Discover Puget Sound, Port Townsend and Seattle to Olympia, Including Hood Canal. This latest addition to the Dreamspeaker selection is a great guide to the waters of Puget Sound, including the South Sound area. If you have never taken the time to head south against the traffic going to the San Juans and Gulf Islands, take a look at this Guide. There are numerous state parks, affordable marinas, and uncrowded anchorages, many of which are uncrowded during the warm summer months. Please help support Boativated.com. Order books using the links below and Boativated gets a small remittance from Amazon.com. Waggoner Cruising Guide. 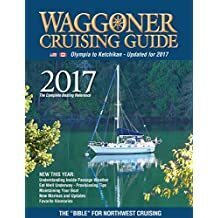 If you are going cruising in the Pacific NW and will have only one guide book this is the one to get. It is updated every year so be sure you buy the current volume. If you have one or more of the cruising guides recommended below, you should still buy Waggoner’s. It offers coverage of marinas and resorts, with phone numbers, recommendations and other information you will find very helpful. Click on the photo to order the book. Gunkholing in the San Juan Islands (Jo Bailey & Carl Nyberg). We have been using the various editions of this book for nearly 30 years. Gunkholing in South Puget Sound (Jo Bailey & Carl Nyberg). Exploring the South Coast of British Columbia (covers the Gulf Islands, Desolation Sound to Port Hardy and Blunden Harbour). Exploring the North Coast of British Columbia 2nd Ed. (covers Blunden Harbour to Dixon Entrance, including the Queen Charlotte Islands). The Inside Passage, Alaska – Canada, South Portion. Sometimes it’s helpful to have a nice big map to see an entire area and plan your cruise. This map shows you the Washington Coast, Puget Sound and south British Columbia all the way to the Queen Charlotte Islands. It makes planning a lot of fun, especially if you have one or more of the Douglass cruising guides. We use ours every year. North of Desolation Sound: (Peter Vassilopoulos). This book has lots of color photos and is a useful guide to the Discovery Islands area. Cruising to the Broughton Islands: Marine Cruising Guides Volume 1: North of Desolation Sound to the Discovery Coast. Another good book by Vassilopoulas. Easy to use and informative, by an author with very extensive experience and knowledge. Anchorages and Marine Parks (Peter Vassilopoulos). The updated edition is now available. This guide often contains information missing from others that is helpful in choosing one anchorage over another. B.C. Docks and destinations (with GPS) (Peter Vassilopoulos). Not everyone wants to anchor all the time. This is a good guide to marinas and docks. 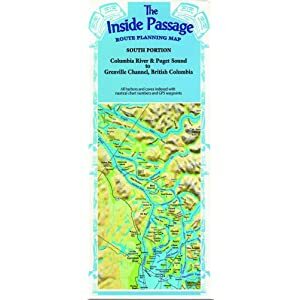 Sailing Directions British Columbia Coast (South Portion) (Volume 1) (Canadian Hydrographics). This is not a “cruising guide”. It is an official government publication intended to be a companion to your official charts. Although written more for large commercial vessels than for recreational cruising it is still a necessary tool for extended cruising in British Columbia. United States Coast Pilot 7 Pacific Coast: California, Oregon, Washington, Hawaii, and Pacific Islands (Paperback, 2015) This volume covers a huge area of the US west coast. Chapters 12 & 13 are relevant to Pacific NW cruising. You can download the individual chapters from the NOAA Office of Coast Survey website. If you are going cruising in the Pacific NW you must have tide and current tables. MUST HAVE! Here are some recommendations. Canadian Current Atlas/Juan de Fuca to Straits of Georgia. If you want to save time and fuel you need to know the time and direction of currents in the various areas of Puget Sound. This is the book that will tell you. It has maps of the entire Puget Sound area with arrows showing the direction and strength of currents every day of the year, 24 hours per day. You can calculate the correct page of the book to look at using the formula specified in the book or you can buy the printed tables that do the work for you. Waggoner tables will do the job. These publications are all available online at various sites or at West Marine, Fisheries Supply, and other retail marine stores. There seems no end to the number of books you can buy for general education and planning. The following list just includes our favorites from the ones we own and use. Nigel Calder’s Cruising Handbook: A Compendium for Coastal and Offshore Sailors (Nigel Calder) This is one of many cruising “handbooks” available. We own several other books by Nigel Calder. He is very knowledgeable and experienced and we think his books are very useful. Some portion of this book gets read on every trip we take. How to Read a Nautical Chart : 2nd ed. A Complete Guide to the Symbols, Abbreviations, and Data Displayed on Nautical Charts Nigel Calder. We use paper charts in addition to our electronic GPS Chartplotter. This book makes sense of all the information contained on your paper chart. If you plan on cruising long distances or in remote areas this is a good book to read and take along. Boatowner’s Mechanical and Electrical Manual: How to Maintain, Repair, and Improve Your Boat’s Essential Systems (Nigel Calder). Somewhere, sometime, something will break on your boat and you will have to figure out what’s wrong and how to fix it. This book has been on our boats for a long time. If nothing else, it will give you a chance to fix something and if you have the basic spares parts you need you will be able to do what has to be done. Nigel Calder is amazing well versed on everything on a boat and his books make sense of things. Marine Diesel Engines: Maintenance, Troubleshooting, and Repair . Nigel Calder This book will not turn you into a diesel mechanic, but it is a good guide to diagnosing and fixing problems with your engine. It also covers basic maintenance jobs that you can do yourself. I use my copy of this book everytime I do something on my engine. Offshore Cruising companion : An Indispensible Guide to Preparing Yourself and Your Sailboat for a Safe Offshore Adventure ! (John Neal). John and Amanda Neal operate Mahina Expeditions. They have thousands of miles of experience teaching people how to blue water cruise. This book covers cruising from A – Z. Its a great resource. The Radar Book: Effective Navigation and Collision Avoidance (Kevin Monahan). You can learn to work your radar unit by reading the owner’s manual but this book makes it easier. We use it every time we turn on the radar. Local Knowledge: A Skipper’s Reference : Tacoma To Ketchikan (Kevin Monahan). This book really does have local knowledge in it. If you want to know the best way to avoid problem areas while cruising the Pacific NW this book is a big help. Offshore Cruising Encyclopedia-II (Linda and Steve Dashew). This is an encyclopedia for cruising sailors. It has more than you will ever “need” to know but its so packed full of useful information you won’t believe it. If you really want to go long distance cruising or if your passion is sailing and cruising you should own this book. Surviving the Storm: Coastal and Offshore Tactics (Steve Dashew). Our goal has always been to avoid big storms and heavy weather. While cruising the Pacific NW it is usually possible to keep trouble at a distance. However, there are times when storms come us very quickly or schedules do not permits waiting a day or two. If you plan to cruise a lot, buy this book and read it. Then keep it on board. If nothing else it will give you the ability to not screw up and the confidence to do the right thing when the going gets tough. Mariners Weather Handbook. Buy this book and read it if you want to know more about marine and ocean weather, than you will ever need. Then, you will have the knowledge you need, when you need it. A comprehensive review, based upon many years of experience. The Annapolis Book of Seamanship, 3rd Completely Revised, Expanded and Updated Edition. John Rousmaniere. Before you start thinking you are a competent skipper, read this book. It is a very good guide to a huge range of topics. We learned to anchor by reading this book and it has been our companion for 30 years. Pacific Mexico, A Cruisers Guidebook. Sea Of Cortez. A Cruisers Guidebook. Shawn Breeding and Heather Bansmer. We have never been to Mexican waters so we have only read these books at home. However, based upon our knowledge of many cruising guides, it is safe to say these are very well organized, easy to read, and beautiful books. The authors have compiled extensive information for an area of the world that is lacking in good charts and guides. Check out their books if you are headed for Mexico or dreaming of the trip.